Why rushing legislation isn't democratic and doesn't meet the standard. The proposed changes to our Security Act needs close and robust scrutiny. Unfortunately, our government does not share that view, so much so that it only allowed one day for submissions on the proposed Countering Terrorist Fighters Legislation Bill, and is also being very brief with the periods to submit submissions and consult in other legislation regarding national security. Chris Finlayson - like other National ministers - does not think consulting with the New Zealand public is important. However, I will give him this, he is honest in his distain for consulting New Zealanders. Other ministers from National will fudge their way through consultation, talk the talk of a person who will listen to all sides and then completely ignore the majority and common sense anyway. Because we all know Hekia Parata just barges ahead with changes despite consulting which shows 90+% of responders and research opposing her initiatives. 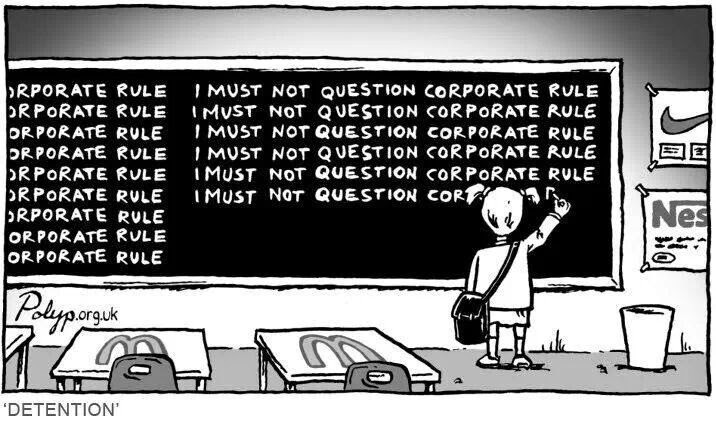 The fact that Charter Schools have been implemented and that she is pushing through the establishment of EDUCANZ and IES on top of National Standards, which all have been opposed by the education sector, academics, research, common sense and even parents (all of which make up the voting public) is testimony of how National does something despite it being a bad idea. What disappoints me most is this is an obvious attempt to by-pass parliamentary and democratic processes. National has been very good at doing this in the last few years. They push through legislation with minimal consultation and using urgency more than what anyone should be comfortable. 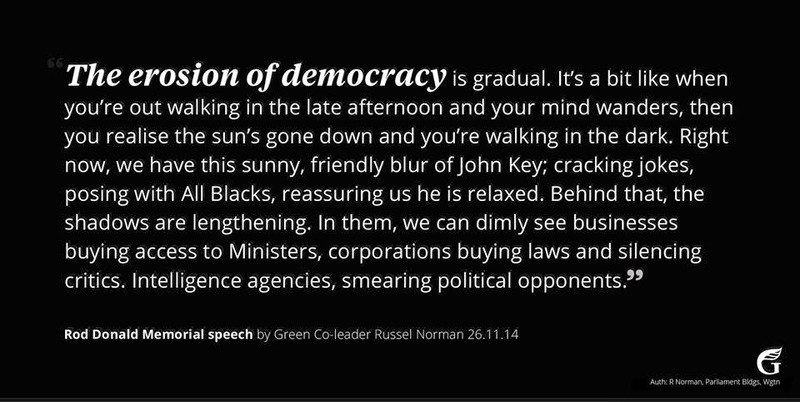 But the above quote from a speech Russel Norman gave on the 26 of November at the Rod Donald Memorial, speaks of how our democracy is being so easily eroded by our 'friendly' Prime Minister and his ministerial colleagues. I was in London when 9/11 happened. 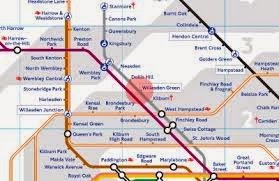 I lived in Willesden Green/Dollis Hill on the Metropolitan Line in north-west London at the time. It was an area where not many English people live. It had a high population of immigrants, particularly from Muslim countries, and also from the Caribbean, as well as an awful lot of Irish, Aussies, Kiwis and Saffas (South Africans) with the odd Canadian, Israeli and Swede thrown in - well, at least in our house. I worked in schools with children who came from families who did not speak English as a second language and with girls who wore head scarves. And the day of 9/11, as I watched it all unfold on TV after a call from Israel to my flat mate, I ate Halal chicken from Sam's Chicken around the corner from our house (it cost two pound for a combo and I was broke). Don't go on the Underground on Tuesday. A friend's son was on a bus in London sitting beside a Middle Eastern man. When he got off the bus he had left his wallet behind. My friend's son chased after him to return it, and when he did, the man was so grateful he warned him not to used the Underground on Tuesday because there will be an attack. This went on for months. It also didn't help that with Diwali and Guy Fawkes so close together and occurring at the same time the US was invading Afghanistan, any fireworks had us thinking that we were about to be blown up at any stage. I also saw people verbally attack people of Middle Eastern extraction. My Saffa flatmate came home one day telling us of a verbal attack he did. After some stern discussion, I think I managed to inform him that he'd verbally attacked a Sikh man - nothing to do with 9/11. And now we have evidence of this in New Zealand with young women and girls being verbally abused by other members of the public and even other religious communities such as the Jewish and Buddhist communities have expressed alarm at this legislation and how the public perceives them due to the current climate. (Muslim communities facing a 'backlash' over law, 28 November 2014, Stuff). My point here is that we became paranoid for a period of time due to the circumstances. During that time a number of restrictions were put on to the public in many countries to tighten up security. For example, in November 2001 I travelled by plane from London to Dublin to watch the All Blacks play Ireland. I had my make-up case as a piece of carry on luggage, as I had had in all the flights I'd taken prior to 9/11. Security asked if I had nail scissors in there, which I did. I had to remove them and put them in my checked luggage in case I planned to hijack the plane with them. Prior to 9/11, nail scissors were not considered a threat, but now they are. 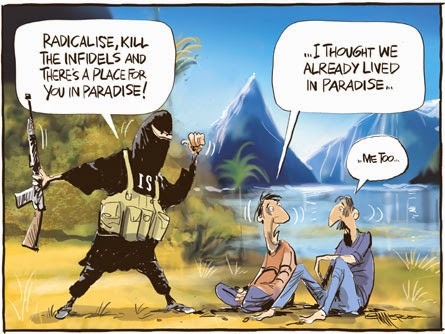 So prior to the rise of ISIS in Syria and Iraq (and wherever else), the fact that we may have disaffected people in New Zealand that are sympathetic to the cause of a rebel organisation like ISIS was not a concern to our government. If it was, they would have considered similar legislation long ago and given it due process. After all, there was Al Qaida around after all and we have had evidence of people running off to join them. 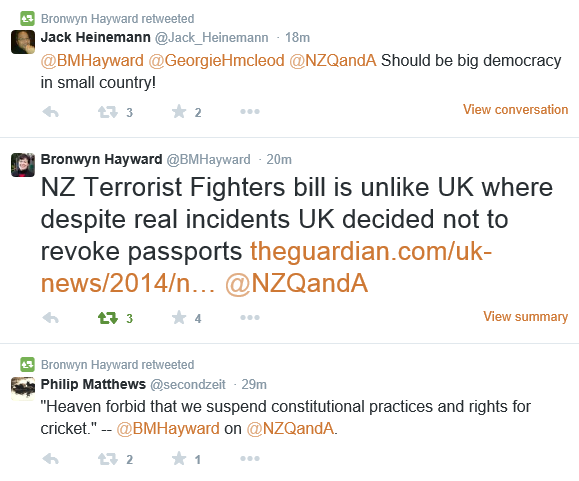 And how does this affect those New Zealanders who choose to fight for the French Foreign Legion? It really is a spit in the face for all the New Zealanders who fought in the Spannish Civil War in the 1930s, or other similar events. Because under this legislation they would have broken New Zealand law. Really, what would be good is if our government, and other governments from around the world did, is look at why these people are so disaffected and want to run off to be cannon fodder for organisations like ISIS or Al Qaida before it. What makes these people susceptible to falling for their PR/propaganda? What is their education, home life, qualifications, employment status? Are there patterns? We were awarded co-hosting of the Cricket World Cup for 2015 in 2006. So our governments since have had ample time to consider security issues and required legislation. We held the Rugby World Cup, a junior women's world event for soccer/football and the world cup for the under 21 rugby teams as well as numerous other events.... any one of these could have been a target for a disaffected wannabe terrorist, yet we have had no events. Michelle Boag's assertion on TV1's Q&A on Sunday 30 November about cricket events in the sub-Asian continent being cancelled due to potential terrorism threats and the fact that Muslim countries play cricket and increase the risk of a terrorist event was scare mongering at best, but racist and offensive to New Zealand's Muslim and Asian communities. Quite frankly this pattern of our own government to shoot from the hip and pass crap laws in reaction to events and ideology without proper consultation and research or trials is well below the standard. The lack of standards this government displays erodes our democracy. 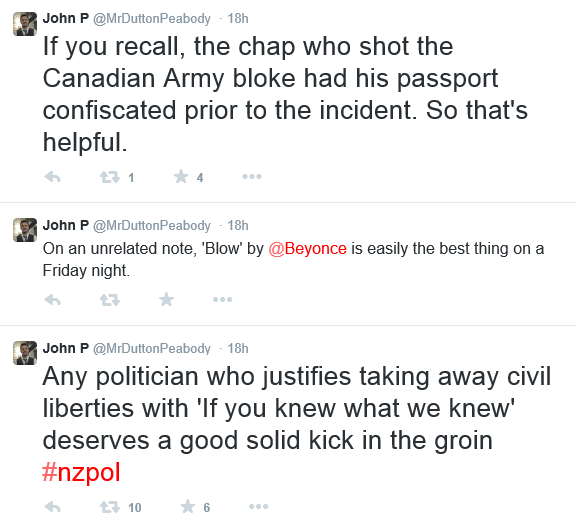 Russel Norman and Metiria Turei from the Greens have stood up and said so. I was heartened to hear Andrew Little say earlier this week that his SIS briefing did not back up the rush that this legislation is being pushed with. He has indicated that Labour will not take it at face value and will look closer into it before deciding its position on supporting it or not. Chris Finlayson is also our Attorney General. His job is to ensure that all the laws of our land are upheld and everyone gets a fair go under the eyes of the law. His comments about the government not needing six months of chit chat undermine his position as Attorney General as he is not upholding how laws are brought into being; he is not upholding parliamentary process; he is not upholding democracy. So, in my opinion, Chris Finlayson fails the standard. 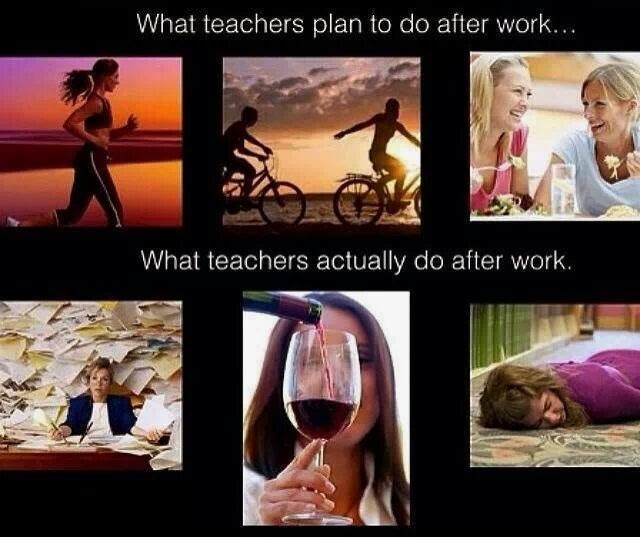 Am I the only person thinking this about the teaching profession? I've been wondering.... wondering if we're becoming so obsessed with professionalising teaching we're losing sight of the individual teacher. This may be controversial. But I think if someone is not willing to stop and challenge this road we seem to be travelling, we may go too far down the road of no return. New can be great; change and innovation is vital. But we need to carefully balance this. We need to be careful not to throw the baby out with the bathwater in this drive to professionalise the teaching profession. 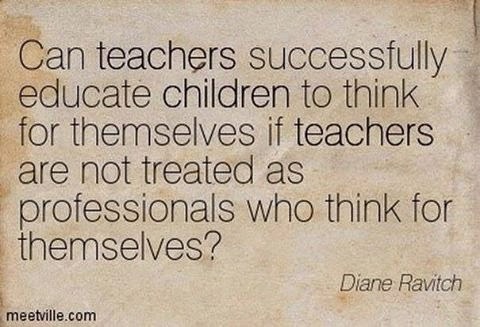 I say this because we individualise, personalise learning for our students, but the currently climate is trying to make teachers uniform, cookie-cutter versions of what is supposedly a 'professional teacher'. 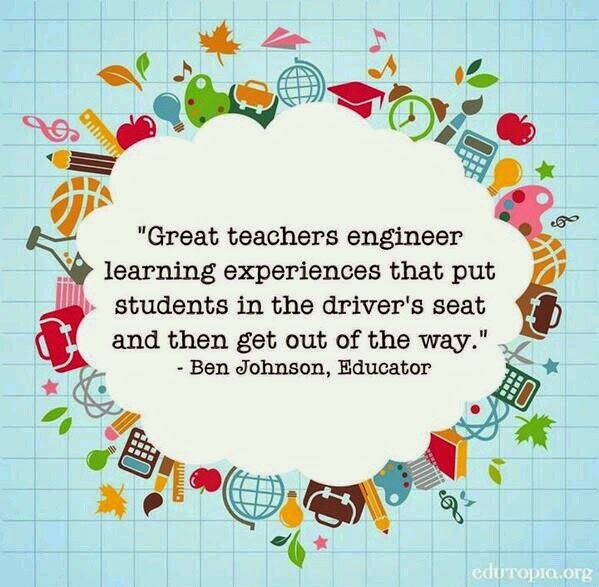 And I worry about this because I think we are beginning to squeeze what makes each teacher special out of them and consequently the joy of teaching. I worry that we are not appreciating what makes each teacher special - their talents, their strengths, their weaknesses and even their own failings. And some of the current generation of principals seem to be inadvertently leading this. Some of them seem more intent on ticking the boxes the MOE demands than forming strong relationships with their staff, finding out what makes them tick. As a result some of them are not always utilising the strengths and talents of the individuals on staff. Parental expectations and pressures also put these principals in a difficult position, often in opposition to supporting their staff. As a generation of old school principals retire I feel that the essence of teaching and the 'history' of the New Zealand education system is being pushed into the junk room in favour of the 'sanitising' of teaching into a profession of tick boxes rather than relationships. Many old school principals tended to have an understanding of their staff and what made them tick, what balance of people were needed to having a dynamic learning school. Some often made concessions or created opportunities to keep the best people in their school (not to say that many of the current generation of principals don't do this, because each principal is their own individual). In the effort to create cookie-cutter professionals we also have created an issue with one size fits all whole staff Professional Learning Development (PLD). 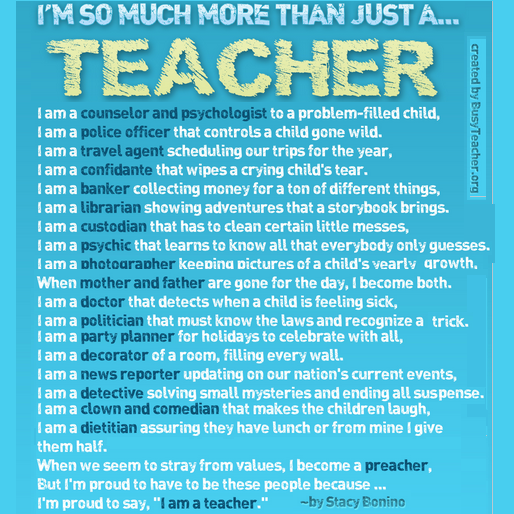 Again this does not take into account the strengths or weaknesses each individual teacher has. Whole school PLD has been the norm for the last ten years or so, and the current government killed other PLD options in 2009 when they cut funding to the Teacher Advisory Service meaning that the teacher who had a weakness in science could no long access a science advisor or attend a science course run by Advisory. In 2013 @MissDtheTeacher established #edchatnz on Twitter fortnightly on a Thursday night. It created a formal opportunity for teachers on Twitter to meet virtually and discuss various education topics. This hashtag has enabled random conversations at any other point in time to spontaneously erupt. 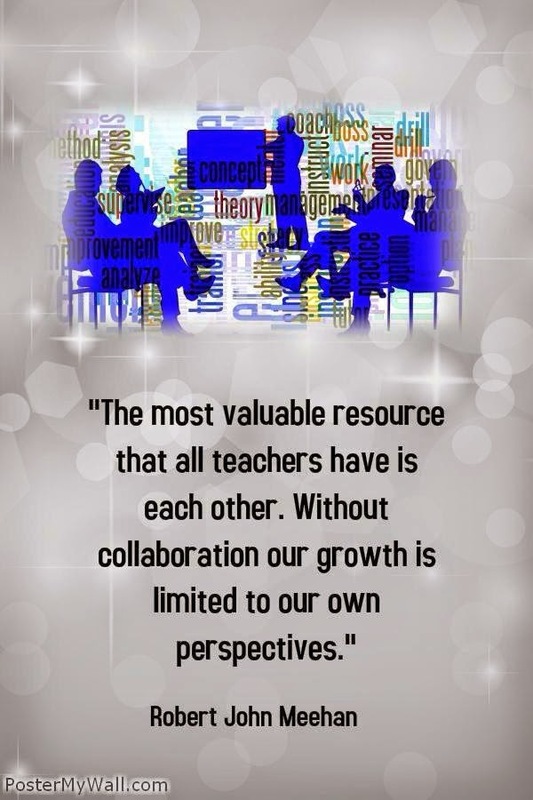 This gives educators the opportunity to learn from each other as well. Personally, I have learned heaps from this forum that has never come to my attention before and I have made new connections, networks and friends as a result of Twitter, Educamps and Eduignites. From #edchatnz has come many other hashtags for specialist areas in New Zealand education, such as for science teachers, geography teachers, English teachers, PE teachers, primary teachers, principals..... schools are creating their own hashtags to encourage professional discussion.... There was even a conference (in an unconference style) held in early term 3 at Hobsonville Point Secondary School. This is real time learning, real time PLD, driven by the people interacting with each other. 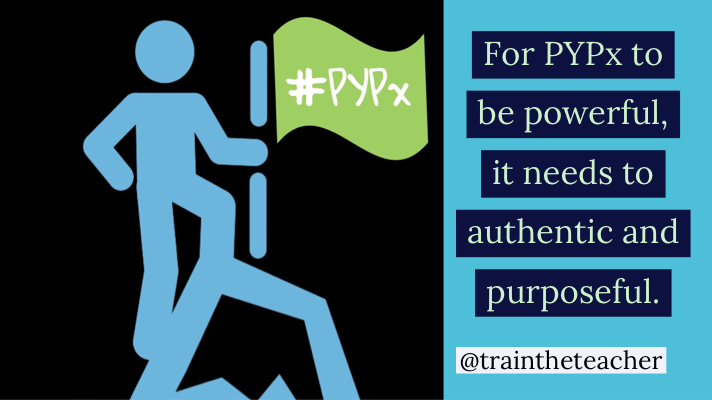 Yet is this form of PLD recognised in this current drive for professionalism that teaching is experiencing? Is the individualisation of what each teacher needs allowed to breath? As part of the Registered Teacher Criteria (RTCs), we are now expected to do a Teacher Inquiry. How many of us actually know how to do this? This has stepped up in the last couple of years, more schools are paying attention to this as they recognise it as needing to be part of the appraisal process for each teacher. But I have an issue with this. I don't know how to do this. 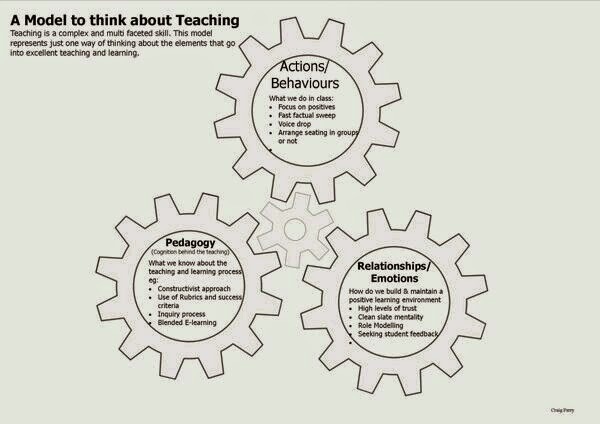 Has any PLD on this been supplied in any school I have been in? Not while I've been there. I think I should make my teacher inquiry "what is a teacher inquiry and how do I do one?" Then there are the companies that are helping schools to revolutionise their appraisal systems and provide the teachers guidelines in how do teacher inquiries and evaluate their professionalism and skills against the RTCs. I heard about one such company this week. I am not going to name the company, because there is still so much I have yet to learn about them and the system they have, so these are my initial responses from the little I've heard and comprehended. There is a matrix of sorts that a teacher is assessed on. Let's say they were poor at replying to emails. This could drop that teacher from being considered an advanced teacher to an amateur teacher despite the relationships they have with students, their planning and programmes and how effective they are and the teacher's contribution to the 'corporate life' (I hate that term in the school setting) of the school. If you are not doing professional reading, you are considered an amateur. And then there were a variety of other things from any individual's life outside of school in their personal and family lives that could reduce your professionalism to amateur level. This came through my Facebook feed on Sunday morning from a group I belong to called Badass Teachers or BATs (the USA group). And this is where I see these appraisal systems leading to, making value judgements on teachers using student assessment data and scores from teacher performance matrixes to give an evaluation score and label to a teacher that is completely separate from the reality of the classroom interactions, relationships and learning. 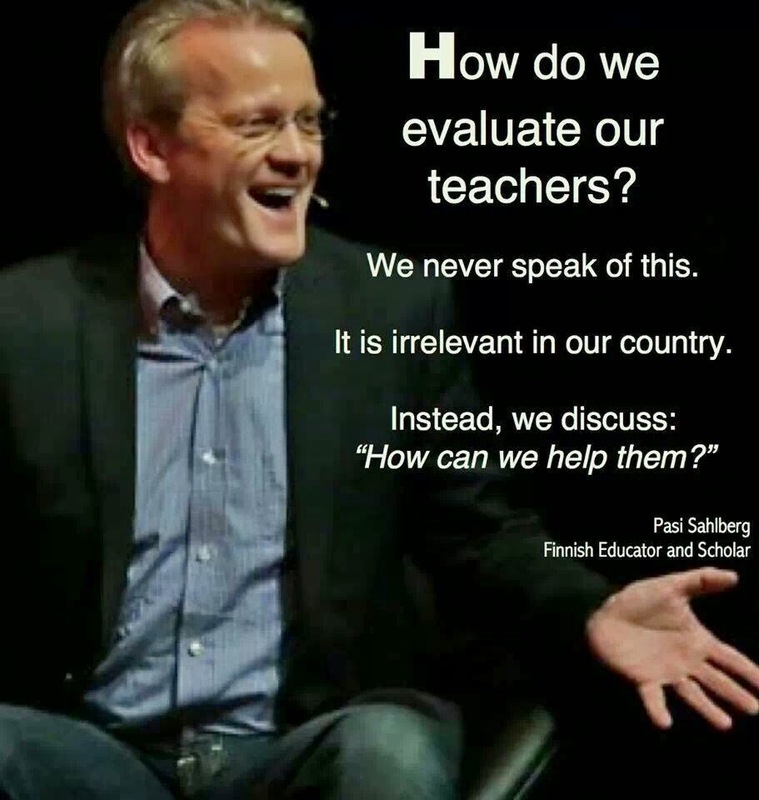 So I have an issue with where we are going into New Zealand in how we evaluate teacher performance and why, because teaching is an art, not a science. It is about relationships that are formed, bonds of trust and affection and respect that make a classroom an effective learning and teaching space for students and teachers. When we sanitise and cookie-cut the art of teaching, not only does the joy of teaching disappear, but the relationships will suffer: teacher:student, teacher:teacher. Do I spend all my time on returning emails so I am judged to be a professional, or do I take the time to interact with students and observe their interactions in that time before the morning bell goes off? Should I never read a Wilbur Smith novel or a Women's Weekly magazine again? Should I go home and be a hermit and never have any personal life experiences where I may ruin my professional reputation by accident? And where will these evaluations lead in the long term? We all know that Hekia Parata (Minister of Education) has performance pay in her sights, despite denials after her initial slip of the tongue. Do we want to help advance her vision of performance pay in education? As teachers, are we failing ourselves, our own standards, by letting the art of teaching become a science of teaching? Are we down trading from the joy of teaching to the professionalism of teaching? Are we ceding that being a teacher is more important than being a family member, a friend, a participant in any sporting/cultural aspect of the community, union/political activist? Are we "blanding" the teaching profession? I leave you with a few pictures to inspire your own thinking, whether you agree with me or not, and some of these pictures may be contrary to what I have written even. The whole purpose of this post is to ignite thinking, ignite discussion and conversation, to challenge the reader's thoughts.